Curated by Penny McCann, Video Cache is a digital video screening comprised of ten works from the original SAW Video Mediatheque launched in 2004. Video Cache was presented in November, 2010 at Montreal’s Groupe Intervention Vidéo as part of Wayward, a collaborative project by Mél Hogan and Nikki Forrest. Wayward is Hogan’s doctoral research creation play space, and Forrest’s experimental playground for situating art in relation to the web. 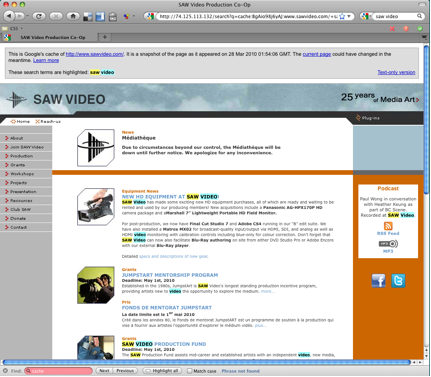 Go to SAW Video Mediatheque, VIDEO CACHE curated program. Download the VIDEO CACHE catalogue here. This interview takes as a starting point the VIDEO CACHE project. Mél’s research into defunct video art repositories online raises many questions about the ephemeral nature of digital culture, and the social/cultural parameters that frame the preservation of and access to such materials. 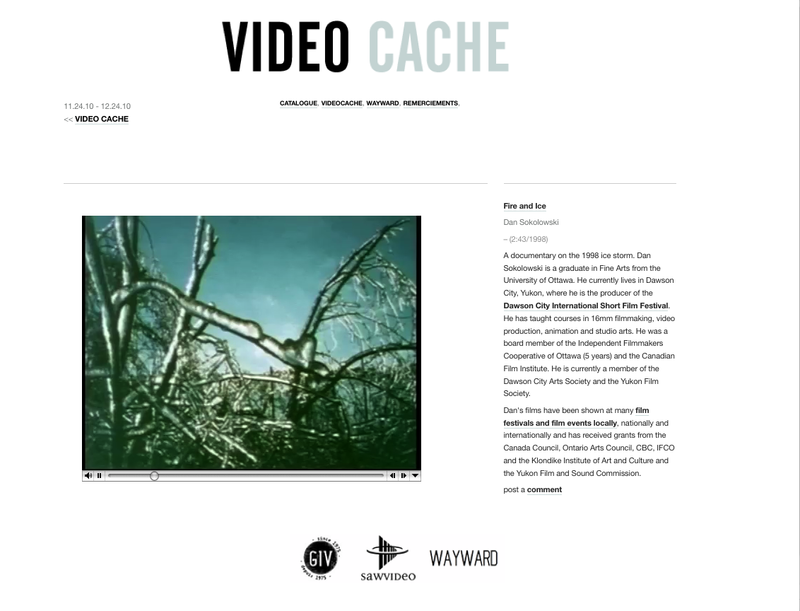 VIDEO CACHE is a research creation project emerging from Mél Hogan’s doctoral research (wayward.ca), in collaboration with Penny McCann, director of SAW Video in Ottawa, and Groupe intervention video (GIV) in Montreal. VIDEO CACHE took place on November 24, 2010 at GIV. 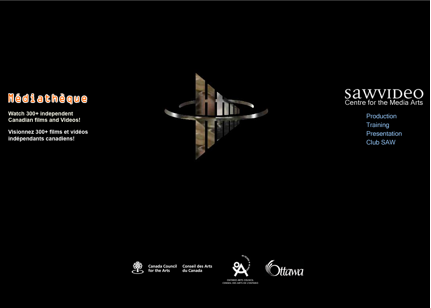 It was a public screening of ten works selected by McCann from the SAW Video Mediatheque collection, for which artists’ fees were paid by GIV. The Mediatheque is Canada’s first large-scale attempt to use the web as a ‘living archive’ –its server crashed in 2009 and the project has been offline since. VIDEO CACHE was also a month-long online exhibit (http://www.wayward.ca/videocache/) showcasing these ten works, carefully documented and recontextualised for the web. The documentation for VIDEO CACHE remains online, and the event catalogue is available via print-on-demand (http://www.lulu.com/product/paperback/video-cache/13585058). On the one hand, VIDEO CACHE served to document the Mediatheque project by updating the context and addressing in a practical way what it means to ‘activate’ the online archive. On the other hand, it was and remains an entity onto itself. VIDEO CACHE has become an opportunity for Hogan to bring a creative dimension to documentation and to address loss: while it is the ‘cache’ that makes the Mediatheque’s traces visible and re-visit-able, it is the ‘crash’ that signals its ongoing (archival) value. You’ve talked about there being a paradox in the way digital culture is created and shared and the way it is preserved. How do you think preservation, creation, and use should be interrelated in the digital realm? I don’t know that the paradox needs to be resolved so much as it needs to be acknowledged and understood within digital preservation debates. In my work what stands out is that more attention needs to be paid to digital flows, to circulation, and to the interface and database that facilitate and mask distribution online. Preservation, as an idea and as an ideal, is transformed online, though for some reason, stating this is always a bit controversial. I think preservation, creation, and use are already interrelated in the digital realm—and that the archival conundrum actually lies in the fact that these elements are difficult to distinguish from each other. I think, if anything, the digital realm will keep moving in the direction of embedding the archive into technologies of creation, dissemination, and display. So maybe the question is how do we conceive of preservation, creation, and use as distinct entities in the digital online realm—rather than interrelated—and if a distinction is no longer possible, what the implications are of that interrelatedness. You said that in your work ‘more attention needs to be paid to digital flows, to circulation itself, and to the interface and database that facilitate and mask distribution online’. Can you talk a bit more about this and how you think the interrelation between the ‘front end’ and ‘back end’ of online systems informs our perception and use of the archive? When I say digital flows need to be addressed, I’m talking about community as much as I’m taking about trajectory. It’s an idea I’ve been stuck on for a while but also have a hard time articulating. From reading Ann Cvetkovich, Wendy HK Chun, Josephine Bosma, Anjali Arondekar, Tess Takahashi and others, I’m reminded of the underlying communities—online and offline—the people with a need and compulsion to collect, so that later, something can be made sense of, revealed. The archive ultimately makes possible connections that are sometimes dangerous or undesirable within a particular time and place. My hunch is that while the web has the potential to highlight the connections between people and their documented pasts, and with unprecedented reach, it also risks amalgamating everything into a large undifferentiated database that completely overlooks and overwrites the affective and the unarchivable. As for the relationship between the front end and the back end, I think that we literally interact with an interface without knowing much of what generates our experiences online beyond that top layer. This isn’t new or limited to the web—this is basically our relationship to most technologies—but in the last few years, separating content from style and function (or form), has been pushed by developers. This has been mainly because browsers display content differently, and the separation made accessibility standards possible, making it easy to quickly and efficiently change the look of the interface without affecting content. Ultimately, the idea was to have form follow function, that is, to have use determine the appearance. So if we can take that kind of approach into account for the online archive, we begin to see what ideals shape the possibilities of the web for preservation. What role do you think video artists or other digital content creators should play in the preservation of their own work? I think this a really hard question to answer, but I’m going to respond from a personal point of view, as someone who makes video… and I am fully aware that I might make archivists and distributors shudder. I’m really for online access in principle, though I understand that in practice, it takes time, know-how, money, resources, etc. I haven’t even bothered to upload most of my videos online, so this is an ideal, a philosophical position. But it’s an ideal by which Canadian video distributors have not yet been seduced, and probably will not adopt anytime soon. And I get this—I get that making decisions about large valuable collections is something to think about carefully because once work is posted online, it simultaneously belongs to nobody and everybody. Part of what inspires me to launch works into cyberspace is the politics of community-based activism that were about getting stuff out, sharing, exchanging ideas. There was an urgency and purpose. And as the tools became increasingly accessible, video art was about countering the mainstream in terms of both representation and means of sharing. But now it seems like the web has taken access to another level, and this is again shifting the politics of video art. A lot of the politics that came out of video are similar to what we hear now about the web—in terms of its democratizing potential—and yet, the more video becomes common, the more precious the distinctions between art and the vernacular seem to become. The fact that a video can be posted and embedded in numerous online contexts does not generally appeal to video distributors in Canada, who would rather see works maintained and presented in controlled environments where issues of resolution, duration, format, storage, and so on, are all carefully calculated to maintain the scarcity model on which they rest. The idea is to keep video art out of the ‘clutter’ of vernacular video—away from YouTube or on a distinct channel within it—so as to retain a curatorial sensibility. So for content creators, I think that the idea of preservation has to be disentangled from marketing strategies, which isn’t easy by any means. In fact, the question of how to monetize content on the web may be the question nobody can answer; this demands an unprecedented level of innovation from video distributors whose best move may in fact be to opt out of the online realm altogether or wait for the hype train to pass… if it ever does. The VIDEO CACHE collaboration with SAW Video activated the archive by screening some of the works from the crashed Mediatheque repository. Re-presentation through emulation or other means is a preservation strategy often undertaken with technological art of many kinds. Did you see VIDEO CACHE in this light at all, as simultaneously documenting and preserving the works? Yes, I see VIDEO CACHE as a documentation project, but perhaps more importantly as a means of highlighting the ways in which the politics of the archive—any archive—are a reflection of the social movement(s) from which they emerge, including art movement(s). Video art history is imbued with politics and counter-movements, and these shape the discourses surrounding the video art archive on the web. I see it less as an attempt to preserve the work within a long-term strategy where the material objects (DVDs for example) are central to the project’s history, and more in terms of preservation-as-conversation, keeping the project ‘alive’ by way of continued dialogue. Rooted in a feminist methodology, I frame VIDEO CACHE as way of bringing to the forefront the people involved in the Mediatheque—as artists or web developers or both—and their understandings of the process and labour involved, along with how their memories shape the ideals of video art and of the archive. It’s important to remember that this all started in the early 2000s, long before YouTube and broadband internet. It’s also important to mention that this project was funded as an online archive—that concept made sense very early on somehow, in that the promise of the web for preservation was something to invest in seriously, backed by hundreds of thousands of dollars of government money. In some ways, activating the archive through a collaboratively curated event serves to document it better than written documentation would on its own; this is research-creation. The VIDEO CACHE screening and the online exhibit preserve and regenerate the Mediatheque, but very differently. Curating a programme for a screening makes sense when you are talking about video, but it also raises a slew of questions about this assumption, given that as an online archive the Mediatheque didn’t prioritize high quality copies for screening—it was about showcasing video art online. This is a point in video art’s history that demands a look inward rather than forward. It demands a reflection on the trajectory of video art from its activist roots and from is dissident voices against mainstream representation—by women, queers, people of colour, community activists, etc.—to the current place and value of these scarce collections in an art market. The Mediatheque is a prime case study for an archive that functioned for and through the web and privileged wide access over long-term material preservation of the files. Whether flawed or visionary as an archival approach, VIDEO CACHE preserves this idea, the Mediatheque’s aura, and the conceptual history of the project. VIDEO CACHE was about extending what I have learned from analyzing grant reports and other administrative documents made available to me by SAW Video into a case study, by highlighting preservation issues from 2003 to the present and showcasing the collection as two different modalities. We also discovered quirky and confusing things in the process of organizing VIDEO CACHE, that again speak volumes about the archive’s politics. 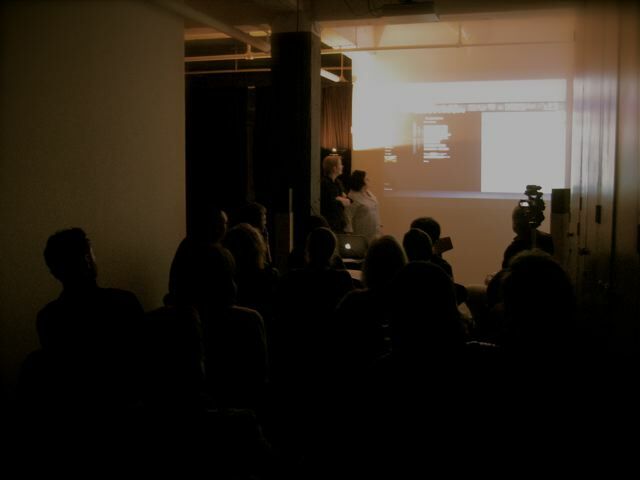 From November 24, 2010 to December 24, 2010, 9 of the 10 videos screened at GIV were showcased online athttp://www.wayward.ca/videocache. Despite being remunerated $200 as part of the Mediatheque in 2003, the distributor, VTape, opted out of letting us show Gunilla Josephson’s Hello Ingmar (2000) for the month-long online exhibit of VIDEO CACHE. VTape continues its research into fees for streaming in order to develop a standard. This apparently applies to works already online and, as is the case for Josephson’s video, works for which the Mediatheque retains online showcasing rights in perpetuity. I don’t think this is VTape’s prerogative alone—the control over video art distribution, its value, and its position within art worlds and markets continues to be debated, with a prevailing Canadian bias towards the ‘web-means-dead’ credo for video art distribution. Through the process of curating VIDEO CACHE, we unraveled many things about the Mediatheque archival method itself that feed back into the research on documenting the initiative. This is the ideal intervention for me: collaboration that emerges from research and that also uncovers and generates new threads, new concepts, and new problems. It is a highly self-reflexive approach and one that situates the archive as object and source of study. More recently at the May 2011 Database Narrative Archive conference in Montreal (http://www.dnasymposium.com/), Adrian Miles (http://vogmae.net.au/vlog/) asked me why I thought it was necessary to activate or revive the Mediatheque project. I think that collectively we can decide whether there is value to a particular collection—after all, appraisal has always been a crucial step for archivists. Nevertheless, a digital loss or a server crash shouldn’t determine what we keep or discard. Until the Mediatheque is revived, VIDEO CACHE and the trail of documents that have come out of it (like this interview) constitute its main preservation efforts. In your study of defunct or crashed video repositories, what issues would you highlight related to the sustainability of these types of projects? Are there any specific pitfalls you have identified? I think identifying pitfalls is a really important step in research that deals with emergent technology and social media. There is a lot of hype and a lot of excitement about the potential of the web to make things happen, and happen differently. That said, I think it’s important to be able to talk about failure in a generative way, even if highlighting issues related to sustainability is sometimes difficult. In this case, for instance, I am dealing with incredible, invaluable, long-established collections, but am addressing only their host organization’s relationship to the web—how they have resisted it, adapted to it, appropriated it, and so on. So I guess I want to start by saying that I recognize the value of the projects—even if they have ‘failed’—and that identifying pitfalls is in line with, rather than against, this kind of recognition. Generally, what is most striking is that a lot of the pitfalls are relegated, and often mysteriously and suddenly, to technological failures, when in fact much of what happens to archives on and offline can be tracked back to human error and social/cultural parameters. This is what I was able to confirm in my doctoral research, and this is what makes it so complicated; it becomes impossible to make a bullet point list of pitfalls that we can all avoid and build from for future projects. I think engaging with and through technology requires a lot of knowledge on different levels (even with the democratization of media tools), including the upkeep of skills and tracking the constant developments. And this is often downplayed if not made invisible by the interface itself, which in a way becomes another pitfall. Technology facilitates a lot of things, but ultimately it relies on human decisions and energy, and goals within a specific social, cultural, and legal context. This context also largely determines funding possibilities, the handling of copyright issues, the framing of the relationship between art and ownership, and so on, which then get coded into specific projects online. The process is iterative, and technology certainly influences choices in terms of format, access, and layout, but, as almost everyone I spoke with in this research makes clear, without (human) motivation and energy, online projects die. This probably goes without saying, but there seems to be lot more energy and money going into creating websites than into maintaining them. This is perhaps a pitfall too in the sense that the trend toward constantly creating new projects (though often duplicating entire systems) rather than centralizing or bringing content form disparate sources into one content management system might make upkeep more feasible. I believe this is something that Videographe plans to test out; there has been mention of offering up the viTheque repository as a template and/or platform for other institutions. In my study of defunct and crashed online video art repositories in a Canadian context, I found that these philosophies of use differ greatly for each project, but most shared a common discourse about the role, place, and importance of the artist. There is a layer of each of the projects—and some more superficially than others—that reflects the history and trajectory of the artists as a category in Canada, as the first country to pay exhibition fees to artists (in the mid 70s). This is, of course, not the case in most countries, and so it explains some of the particular pitfalls that Canadian repositories fall into in terms of maintaining this professionalization of art into the digital realm, and under conditions that differ greatly from similar initiatives elsewhere. So copyright—or the way it is loosely interpreted and applied—is a major element, and I would say pitfall, in most cases of Canadian online video art repositories. Another pitfall, I think, is the way copyright is being interpreted and, in turn, how technologies are being used to put into measure some of these ideas that, from an archival point of view, seem to pose additional problems rather than provide viable solutions. Technological protection measures, like files that self-erase/destruct after a period of time (chronodégradable), locks based on password protection, locks that limit the number of copies a user can make, and so on, are all ‘solutions’ justified by the desire to protect works from illegal copying (and which by default block fair and legitimate copying). To impart technology with these roles—rather than engaging with these issues as a social process that accounts for fair dealing—is to misconceive of the function of copyright and to throw off its intended balance. Also, with increasingly long terms of copyright (across the globe), this kind of copyright rhetoric becomes commonplace, and access online somehow becomes in itself conceived as an assault to artists’ rights. Copyright is a major issue, if only because it is conflated with other issues, and as a result, those underlying issues aren’t directly addressed. Copyright—and Creative Commons for that matter—are not systems of remuneration for artists, they simply inform the parameters for using other people’s stuff without asking, beyond fair dealing. The initiative to create an online repository requires a huge amount of time, resources, knowledge, and money. This is a point I will keep repeating because being for or against copyright isn’t at the crux of the matter. And, while I think that for the most part an open and free exchange of materials circulating via the web is positive for creativity, I do think copyright and Creative Commons alternatives demand that we continue to question ownership in the face of large user-generated content sites that have at their disposal untapped media content. So this brings me to the issue of funding and financial sustainability. In the projects I have looked at, it seems that funders (often government funding bodies) are eager to fund the creation and development of online repositories for about two years, after which it remains a bit unclear what is expected or how the project is meant to maintain itself. For the most part, these projects are not self-sustaining, and bring in very little in terms of revenues, at least in comparison to the costs incurred maintaining the site. I try to always think of these pitfalls and failures as generative, but I also think that we have many (too many) examples of how trying to contain and control digital flows backfires in terms of preservation strategies. , Let’s Talk Net Art NAi Publishers (2011). 3. http://video.dma.ucla.edu/video/wendy-chun-the-enduring-ephemeral-or-the… Wendy Hui Kyong Chun (2008) The Enduring Ephemeral, or the Future Is a Memory In: Critical Inquiry 35 (Autumn) The University of Chicago: 148. This interview takes as a starting point the VIDEO CACHE project. Hogan’s research into defunct video art repositories online raises many questions about the ephemeral nature of digital culture, and the social/cultural parameters that frame the preservation of and access to such materials. We also discovered quirky and confusing things in the process of organizing VIDEO CACHE, that again speak volumes about the archive’s politics. From November 24, 2010 to December 24, 2010, 9 of the 10 videos screened at GIV were showcased online at http://www.wayward.ca/videocache. Despite being remunerated $200 as part of the Mediatheque in 2003, the distributor, VTape, opted out of letting us show Gunilla Josephson’s Hello Ingmar (2000) for the month-long online exhibit of VIDEO CACHE. VTape continues its research into fees for streaming in order to develop a standard. This apparently applies to works already online and, as is the case for Josephson’s video, works for which the Mediatheque retains online showcasing rights in perpetuity. I don’t think this is VTape’s prerogative alone—the control over video art distribution, its value, and its position within art worlds and markets continues to be debated, with a prevailing Canadian bias towards the ‘web-means-dead’ credo for video art distribution. 3. http://video.dma.ucla.edu/video/wendy-chun-the-enduring-ephemeral-or-the-future-is-a-memory/19; Wendy Hui Kyong Chun (2008) The Enduring Ephemeral, or the Future Is a Memory In: Critical Inquiry 35 (Autumn) The University of Chicago: 148. CM: Basically the OA movement is founded on the idea that publicly funded scholarship and research should be freely available for unrestricted use. There are philosophical similarities to parallel movements in free software and culture, although OA really gained momentum in the early 90s as a response to what is known in academic libraries as the ‘serials crisis’. I’m going to tell you a story about an archive. Canada has one of the oldest online video art archives, if not the oldest, on the web. Few people know about it. Launched in 2003 after a year as a pilot project, SAW Video in Ottawa was responsible for creating a repository of 486 independently-produced videos accessible for free online, in full length. This project was called the Mediatheque. Its web infrastructure was custom-built, and the archival process relied heavily on trial and error as no precedent existed for this kind of endeavour. The funding for the Mediatheque was allocated specifically as an archival grant under the Canadian Culture Online Funding Programs from the Department of Canadian Heritage. Preceding YouTube by two years and reaching a terabyte (over a 1000 GB) of content , the Mediatheque placed an open call for video artists and paid 200 dollars per submission for the rights to showcase works for 3 years online. The Mediatheque lived long enough to see this contract with artists expire, though most artists agreed to renew the rights, this time without payment. 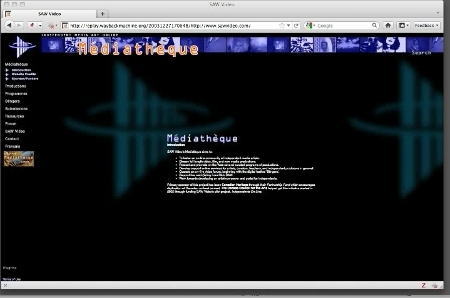 In this second phase, starting in 2006, the Mediatheque continued to add new works, and featured more than 300 videos from the original pool. In 2009, the Mediatheque’s server crashed and the project has been offline since. There was no database backup at SAW Video, nor with their corporate sponsor who was hosting the project. Neither had assumed it their responsibility. Saw Video reassembled its website using Google Cache but never attempted to piece together the Mediatheque via the Wayback Machine or other means. For SAW Video, the crash represented an opportunity if not a cry for change. It was time for reflecting on the project in relationship to emergent social media that now largely constitute the web. After more than 6 years online, had the needs for this archive changed? Had the context for video art expanded in ways to render the project obsolete? Revived, would the Mediatheque be a relic, or does it remain a failure of the very concept of online archiving by virtue of its ephemeral nature? Is failure embedded into the concept of the online archive? Apart from the grant application and few reports to the government, little documentation exists about the Mediatheque, and nothing at all exists that attempts to answer these questions or to situate the Mediatheque within the framework of media studies, archival theory, or video art’s art history. (Besides my doctoral work, that is). Today, SAW Video plans to rebuild an archive containing many of these videos, however no longer under the name Mediatheque and with no necessary attachment to the 2003 version. In this sense, the new repository is neither a straightforward continuation nor an attempt to replace the defunct project. The new version was originally intended for December 2010, but continued delays suggest that the conundrums of the online archive remain, for which pragmatic and philosophical questions alike are difficult to answer of in the long-term thinking demanded of the archive by very definition. So the burning question is: is failure embedded? And for the Mediatheque, here. Over the course of the next few months, I will post video clips at wayward.ca that explain the history of these now mostly defunct websites. Because it is a) difficult to describe a trajectory back in through the wayback machine (internet archive) that include numerous iterations of a same project and because b) it is almost impossible to do the same ‘search’ twice, I am recording my findings and posting them here. These digs are totally unrehearsed and unchoreographed, which means that I often get lost in the regenerated loops of the wayback archival process, and take you with me. These digs are meant to record the research process as much as they are intended to document the portals I explore. About the book: Video Vortex Reader II is the Institute of Network Cultures’ second collection of texts that critically explore the rapidly changing landscape of online video and its use. With the success of YouTube (’2 billion views per day’) and the rise of other online video sharing platforms, the moving image has become expansively more popular on the Web, significantly contributing to the culture and ecology of the internet and our everyday lives. In response, the Video Vortex project continues to examine critical issues that are emerging around the production and distribution of online video content.